Every Columbus Day, we’re reminded of the difference between discovery and „discovery“ — and rightly so. 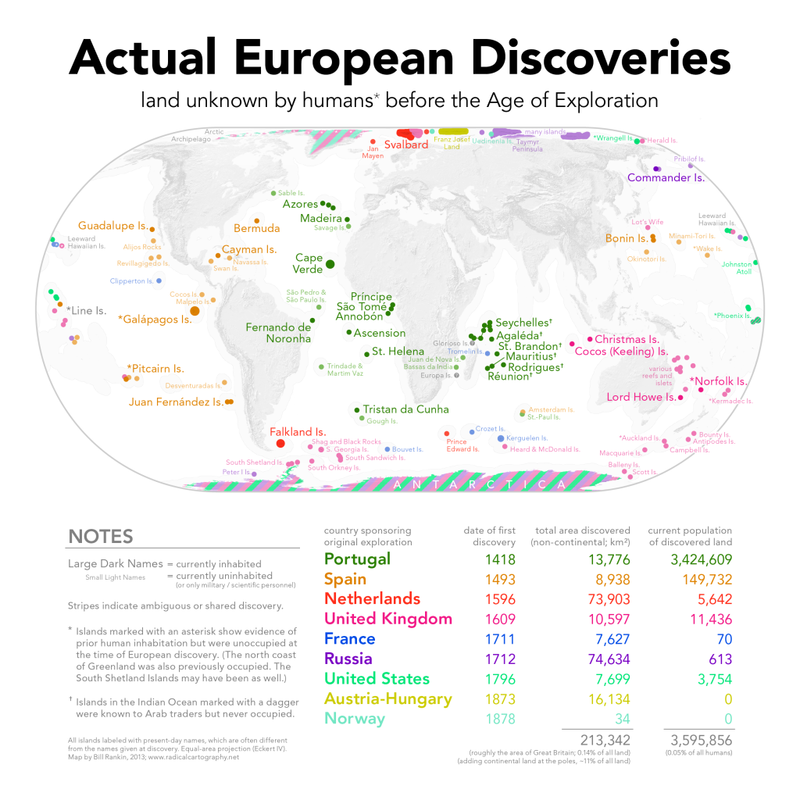 But let’s not sell Europe short; after all, European explorers found plenty of diminutive islands that no human had ever seen before, along with extravagant amounts of ice and snow. Just the islands alone add up to more than 0.14% of the world’s total land area, and today they’re home to more people than live in all of Connecticut! This map also shows the changing geopolitics of exploration. For example, it shows at a glance how the Treaty of Tordesillas split the 16th-century world between the Portuguese and the Spanish; it also shows the dominance of the British in Australasia and south of the Antarctic Convergence. Contrast this with the seemingly random color patterns in the Arctic, Pacific, and southern Indian Oceans, where aggressive whaling often led to a free-for-all of destructive competition. Auch sonst finden Kartographiebegeisterte auf der Seite jede Menge interessantes Material. Man darf sich also den Nachmittag mit etwas Stöbern vertreiben.